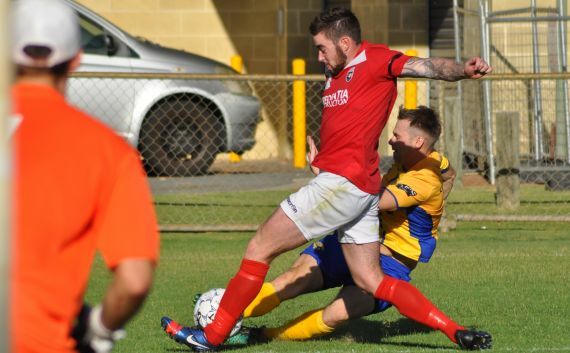 ECU Joondalup defender Cian Hirrell said last week’s win against Inglewood United can kick start their season. The 20-year-old said at 0-2 down it could have got away from them, but they all stuck together and got their rewards. “It was a great come back from the lads, but it was rough start to the game, and everyone agrees on that,” he explained. “After their second goal we suddenly woke up and started to play football and ended up dominating the game. Grabbing a goal just before the half time was even better and nothing less than what we deserved I thought. “We could see their legs were going even in the first half, we are one of the fittest sides in the league and it showed in the second half as we dominated play. There is a new back five at the club, with only Hirrell from last season’s side, but he said the lads are gelling together and they have worked hard to improve in certain aspects of their game. “We have been slow out of the blocks in recent game, and it’s not what we would have hoped, and we’re not sure why that is to be honest,” he said. “It’s a new backline and only me from last season, but all of the lads get on well, we enjoy playing alongside each other and we all back each other 100%. “Obviously with the lads coming to a new club, it does take time for everyone to gel together, and I think the second half against Inglewood we showed that the coaching we are getting is paying off, we just needed a little time. “I think the win will roll on from the weekend bring a ton of confidence to the squad especially the back four. This week the Jacks head to Floreat Athena, and Hirrell said it will be a big challenge, but they are heading their full of confidence after last week’s win. “It’s a massive game this weekend, and it’s never easy playing Floreat especially at their home ground,” he said.